Because they are 100% recyclable, crushed stone and the products made from it conserve the earth’s natural resources. At The Sunrock Group, we’re proud to produce recycled aggregates and other products that do their job while being kind to the earth. 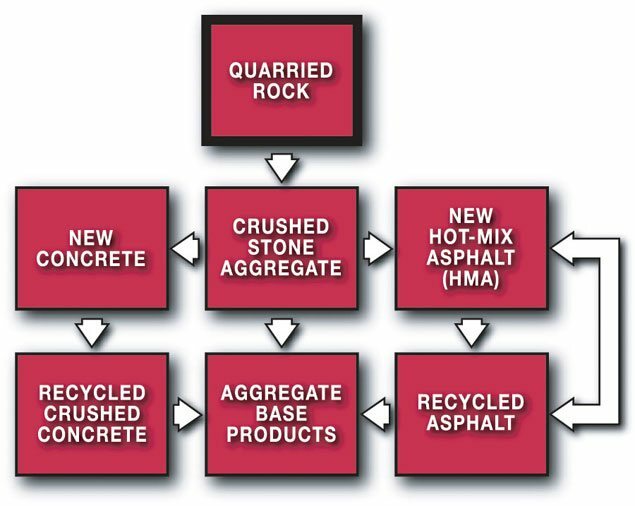 Quarried rock is processed into crushed aggregate, which may be used for the manufacture of concrete, asphalt or road base products. Concrete is composed of an 85% rock and sand mixture and may be recycled into excellent road base product. Hot mix asphalt is a 95% rock and sand blend. When crushed, old hot mix asphalt can be blended with new asphalt mix. The rock and asphalt cement are continually reusable. In addition, the old hot mix asphalt makes an excellent road base product. Learn more about aggregates and recycled construction materials.